The National Highway Traffic Safety Administration has reported that airbags have saved over 10,000 lives and while in combination with seatbelts have been able to prevent head injuries 81 percent of the time and chest injuries 66 percent of the time. An airbag is a type of automobile safety device used to restrain the occupants of a vehicle during a collision. The airbag is created from a flexible fabric envelope or cushion which instantly inflates when a car senses an accident. Most newer model vehicles contain multiple airbags throughout the vehicle in order to protect occupants from a variety of injuries. Unfortunately, in some instances these protective devices may also be the cause of injuries, and possibly even death. The car accident attorneys at The Tapella & Eberspacher Law Firm understand how traumatic of an experience being involved in a car wreck can be, which is why we have dedicated our careers to fighting for our clients justice. Our attorneys will seek to obtain the MAXIMUM compensation benefits available and have recovered MILLIONS in compensation for our clients. To learn more, call us today at (855) 522-5291 or simply complete our the form on this page – It’s 100% free. Over the years, there have been dozens of statistics gathered on lives saved, injuries sustained, and fatalities associated with airbags. 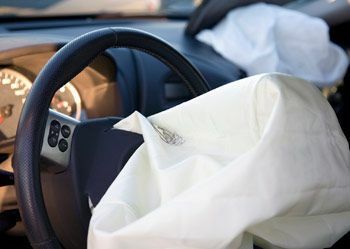 It is clear that airbags are much more beneficial than detrimental in automobile accidents; however, in some cases the injuries or deaths are related to manufacturer errors or occupant negligence. While there may be several injuries caused by airbags, statistics continue to demonstrate that airbags have saved more lives and preventing more injuries, than when no airbags were present. In some cases, when an airbag deploys, it may be ineffective or deploy with enough force to injure individuals who are not intended to be seated in the front seat. Thus, it is recommended to seat children and infants in the back seat, rather than the passenger seat. Following an accident, if you are suffering from any type of injury, it is highly recommended to obtain medical attention. This will assure all injuries have been properly cared for, while also preventing further and hidden injuries from occurring. Also, all medical documentations can be used by our law firm while aspiring to achieve the maximum compensation for your injuries and losses. Buckle Your Seatbelt – When used with an airbag, they have been able to prevent head injuries 81% of the time and chest injuries 66% of the time according to the NHTSA. Children in the Back Seat – Children under the age of 12 should sit in the back seat. Children riding in the front seats are put at an elevated risk of injuries from the airbags. Avoid Putting a Car Seat in the Front – Due to the great amount of force produced by the deployment of airbags, it is advised to never put infants in a rear-facing car seat in the front seat of a vehicle. This force is enough to kill the infant and even small children. Position Yourself Away From Airbags – Between two to three inches from where the airbag inflates is the most dangerous area for passengers. It is recommended to sit at least 10 inches away from the airbags at all times while in the vehicle. Take Precautions if a Child Must Sit in the Front Seat – If there are no other options for children, but to ride in the front seat, it is advised to put the seat all the way back, position the child with its back against the seat and seatbelt across the body, turn off passenger airbags, and use a booster seat. Tilt the Steering Wheel – Face the steering wheel downwards so the airbag will strike your chest rather than your head or neck. Pregnant women are advised to aim the steering wheel away from your belly, but not high enough to strike their head. By following these safety tips and reading over your vehicles owner’s manual, you will be able to avoid airbag related injuries and have your vehicles safety devices programmed to work in your favor. At The Tapella & Eberspacher Law Firm, our attorneys have the knowledge and experience to help you achieve the settlement you deserve for your damages and losses. Our team will fight for your rights and guide you through the entire litigation process, while you recover from your injuries without worrying about paying for all the medical expenses. Based in Charleston, Illinois along with an office located in St. Louis, Missouri, our legal team is able to serve throughout the entire state of Illinois and Missouri and beyond. If you would like to learn more about our law firm, or would like to schedule a “Free Case Evaluation”, we welcome you to contact us today at 855-522-5291 or complete one of the forms located at the top or bottom of this page. It is completely free and confidential.